This monster is Dance Princess of the Nekroz wearing armor based on Gungnir, Dragon of the Ice Barrier. This monster shares the same Attribute, Level, ATK and DEF as the aforementioned monster, and has a similar effect dealing with destroying cards by discarding. There seems to have been no noticeable change in the age of Dance Princess after donning the ritual armor, unlike Shurit, Strategist of the Nekroz and Great Sorcerer of the Nekroz. 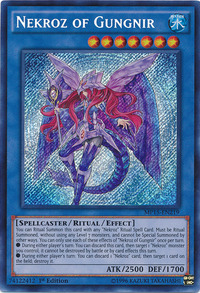 Nekroz Mirror appears in this card's artwork, it is no longer on her forehead and is now instead replacing the Gishki Aquamirror that had formerly been on the staff of Dance Princess. The effects of "Nekroz of Gungnir" cannot be activated during the Damage Step. If a monster affected by the effect of "Nekroz of Gungnir" that is activated from the hand is changed to face-down Defense Position by the effect of "Book of Moon", the effect of "Nekroz of Gungnir" is no longer applied. (It can be destroyed by battle or card effects. ): If a monster affected by the effect of "Nekroz of Gungnir" that is activated from the hand is changed to face-down, what happens? The effect of "Nekroz of Gungnir" that is activated from the hand cannot be activated by targeting a "Nekroz" monster that cannot be destroyed by battle and cards effects, for example, a monster affected by "Mist Body" and "Sea Lord's Amulet". However, if a "Nekroz" monster cannot be destroyed battle or card effect, but not both, then the effect of "Nekroz of Gungnir" that is activated from the hand can be activated. : Can the effect of "Nekroz of Gungnir" that is activated from the hand be activated by targeting a "Nekroz" monster that cannot be destroyed by battle or cards effects by another card effect?